Long before women’s liberation was even on America’s radar, Kitty Wells belted out this great hit written by J.D. "Jay" Miller. During this era in American history and Country Music history; which was dominated by men, this was very cutting edge. This song was an answer song to the Hank Thompson hit "The Wild Side of Life." Recorded by Kitty Wells June 1952 and released later that year, this song quickly caused a lot of controversy, and was banned from NBC radio and the Grand Ole Opry (before becoming a hit of course). Despite launching a new movement of female country singers, Wells would later tell NPR that she was no feminist, in fact when she was approached to sing "It Wasn’t God Who Made Honky Tonk Angels," she was about to give up her career singing with her husband’s band to be a stay at home wife and mother. The recording session paid $125 and she agreed to lay down the vocals to make the money. 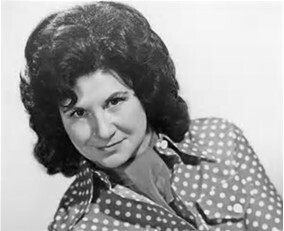 The song quickly became a huge hit, selling over 800,000 copies, making Kitty Wells the first solo female act to hit number one on Billboard’s country chart as well as the first female country singer to cross over to Billboard’s pop chart, and earning her the title "Queen of Country Music." The song took an early feminist stance by going on the offensive against 1950s double standards that allowed men to act as though "they’re still single" while expecting their wives to be waiting for them at home when they chose to return. The song struck a chord especially with the female listening public who did not often hear their side of the story represented in country music. The song also made room for women in the male-dominated, conservative country music industry. Before Wells hit it big with this single, country women were mostly confined to the role of "girl singer" performing with an otherwise all male band. Country women were also rarely given record deals, as their potential to sell singles and albums and sellout theaters was not recognized by the men in charge of country labels. Though she recorded it expecting to net only the $125 recording fee, "It Wasn’t God Who Made Honky Tonk Angels" skyrocketed Kitty Wells to fame and launched her on a successful solo music career that lasted fifty years. With one song, Wells broke down the gender barrier in country music and paved the way for all future female country stars to make it on their own. "There's a great history in American music of answer songs that trump their targets – "This Land Is Your Land," "Roll with Me, Henry," "Sweet Home Alabama," "Roxanne's Revenge" – and this includes Kitty Wells' riposte to Hank Thompson's 1952 hit "The Wild Side of Life." The original condemned an ex-fiancée (whom the singer appears to have stalked) as a common floozy. Wells' revved-up reply (via songwriter Jay Miller, with husband Johnnie Wright on bass!) indicted unfaithful men for making their own empty beds, and scored the first Number One country hit for a solo female artist, inspiring generations to resist submissive stereotypes. As testament to Wells' groundbreaking courage in recording the song, NBC Radio banned it and the Grand Ole Opry forbade her from performing the song on its hallowed stage until they relented due to its growing popularity". Change happens, and in the music industry it happens a lot, some for the good and some would argue often for the bad, either way it’s inevitable. Although written by a man, this song did a lot for the women in country music, if I could tell Kitty one thing today it would be this….We’ve come a long way baby! If we make it through December, we'll be fine"
We lost the “Hag” April 6th 2016 on his 79th birthday. Legend says that a man who is born and dies on the same date is of a special kind and will have many blessings in the afterlife. The country music legend left behind a legacy that won’t soon be forgotten by any foreseeable generations. As I dissected this song line by line I was inspired by the message of hope it gives, like many of the songs Merle is known for. This is what some other folks had to say about the song back when it came out 42 years ago. Released in October 1973, "If We Make It Through December" tells the tale of a factory worker who gets laid off shortly before the holidays and then becomes wracked with guilt over his inability to buy his daughter some "Christmas cheer." With unemployment and inflation at a record high in 1973, and both oil and steel in short supply, America was in the middle of one of its worst recessions to date. But while headlines screamed of "bear markets" and "economic indexes," Haggard's song got right to the heart of the issue: the people behind those headlines. More importantly, it mirrored the optimism that shone through the struggles: "If we make it through December, we'll be fine." All of this gave the song — which hit Number One on the country charts that December — a shelf-life that lasted well beyond the holidays. In the review published October 13, 1973, they wrote, "Another change of pace by Haggard, who keeps surprising with his various styles, and does so well with all. He is a complete artist. "The song spent four weeks at No. 1 on the Billboard Hot Country Singles chart in December 1973 and January 1974, and cracked the Top 30 of the Billboard Hot 100. "If We Make It Through December" was the No. 2 song of the year on Billboard's Hot Country Singles 1974 year-end chart. As I researched this song I found one common thread among all of the interviews of Merle where he talked about this song; and it was this, He was a common man with a past that he wasn’t proud of, but he never gave up and when someone (Johnny Cash) saw something special in him, it turned his life around. He never became too big to admit he couldn’t have done it without some help, and through the hard times he kept holding on…. I think he would want us all to keep that same attitude, Let’s just make it through December. We’ll miss you, Merle.